Comforting Words Comforting Words: Black, Female Christ: Why Not? 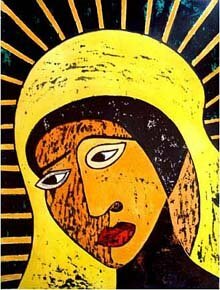 Black, Female Christ: Why Not? If you think that I have been spending quite a bit of time writing letters to the Editor of my local newspaper you are right. I have made the decision to 'walk my talk' and do what I can in my chosen corner to make a difference. As I read Sheila Pratt's "The Use of foreign workers in Ft. McMurray,"(Edmonton Journal, April 16, 2006) it became clear that responsibility is an attitude and approach she is suggesting that the government of Alberta adopts in its planning and leadership. This is pertinent advice and ought also to be adopted by columnists, particularly Lorne Gunter. Reading his column, "Good money in rewriting Christ story," in the same issue and page of the Edmonton Journal, I wondered whether Mr. Gunter merely referred to a most derogatory statement ‘responsibly’ or simply for the sensation factor. While it is not my intention to start a theological debate, for Mr. Gunter and the Ottawa Citizen columnist he so proudly quoted to slyly deride and denigrate black women who are lesbians in one fell swoop is irresponsibility at its heights. Surely, such learned and opinionated men could find metaphors other than “Christ-as-black lesbian,” to make their point without belittling the human dignity of blacks, women and lesbians? Is it so laughable and outrageous to think that a person other than a man, of a darker hue or of the homosexual orientation could be symbolic of the Divine and Sacred? Many might be tempted to consider Mr. Gunter’s reference a bit of frivolity. However, in light of the reality of racism, domestic violence and bigotry experienced by immigrants, non-whites, abused women and homosexuals, if the intention is to truly grow this province opinion-makers and the leaders should adopt a more responsible attitude. posted by Claudette at 11:07 a.m.